What do you call a pain reliever that doesn't have a name yet, is not FDA approved and may not be available for years? Nektar Therapeutics calls it the "opioid of the future." Nektar is a research-based pharmaceutical company that has developed a new type of opioid medication that shows promise in relieving moderate to severe pain, but without the risk of abuse and addiction of traditional opioids like oxycodone or hydrocodone. 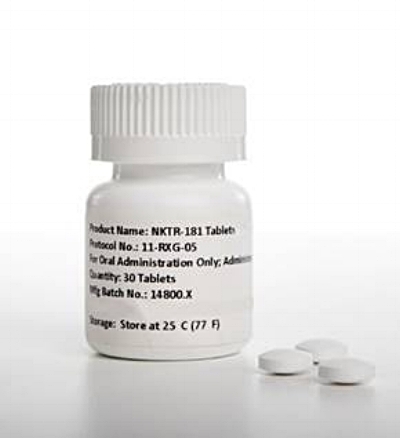 The experimental pill -- which for the time being is called NKTR-181 -- has recieved “fast track” designation from the Food and Drug Administration, but is at least a couple of years away from full FDA approval and a commercial launch. That hasn't stopped Nektar from promoting NKTR-181. This week it hosted a lunch symposium on the drug at PainWeek -- an industry trade show underway in Las Vegas -- a sign of just how confident the company is that NKTR-181 will receive final approval from the FDA. "We think we could see approval as early as the end of next year," says Steve Doberstein, PhD, Chief Scientific Officer of Nektar. "So we could see a launch of this product in the first part of 2019. That would be my aspiration. If we have to do more clinical trial work, it would be delayed." The FDA usually requires at least two "Phase 3" clinical studies to prove a new drug's effectiveness. Nektar has only completed one -- a Phase 3 study of over 600 patients with chronic back pain who reported that their pain scores dropped by an average of 65% when taking NKTR-181 twice daily. Nektar has also completed smaller safety studies that found recreational drug users had significantly less “drug liking” of NKTR-181 -- even at high doses -- when compared oxycodone. Participants also had less daytime sleepiness and fewer withdrawal symptoms. "NKTR-181 is quite boring as far as abuse metrics go. Boring is good. That was our goal. It doesn't appear to cause euphoria," says Doberstein. NKTR-181 is "boring" because of its slow rate of entry into the brain's central nervous system – which significantly reduces the “high” or euphoric effect that recreational users seek. Many pain sufferers don't feel that high when taking opioid medication, they just get pain relief. But in the current regulatory and political climate, the only way a new opioid will be approved by the FDA is if it has a low or non-existent abuse potential. "We're very focused on the fact that one of the building blocks of solving this problem is going to be a safe pain medication for chronic pain patients to take," Doberstein told PNN. "The things that work best are opioids. But the existing conventional old-fashioned opioids -- oxycodone is 100 years old -- come with an unacceptable side effect profile for many patients. And we think we've made something that is legitimately better. It's the first time in a very long time that a new opioid molecule has been developed." Doberstein thinks NKTR-181 has such low potential for abuse that it will not need to come in an abuse deterrent formula that would make it harder to crush or liquefy. The FDA could still require one, however, which would delay the drug's commercialization even longer. The agency is currently reviewing the effectiveness of all drugs with abuse deterrent formulas. The FDA also has a new opioid policy steering committee that is examining whether the agency sufficiently considers the risk of abuse during its evaluation of new opioids. That could result in rule changes that Nektar would have to address. Anti-opioid activists and politicians could also pressure the FDA to require more clinical studies on the safety and potential abuse of NKTR-181. Another potential obstacle is that Nektar still needs to partner with a larger pharmaceutical company to help produce and commercialize NKTR-181 -- which is when the no-name "opioid of the future" will likely get a makeover with a branded name to make it more marketable. "This is the kind of medicine that we think could be quite significant. It could really change medical practice. That means we need a lot of education, and a lot of outreach to physicians, hospitals, payers, patient advocates and law enforcement. We have a lot to do. And its probably beyond us to do it ourselves. So we'll have a commercialization partner of some kind," said Doberstein, who told PNN he expects Nektar to announce its new partnership by the end of the year.